As spring and summer heat up, so will transmission of Ehrlichia spp. 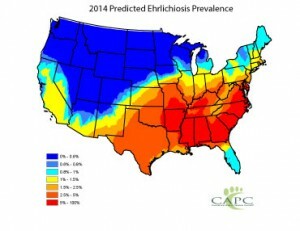 according to the Companion Animal Parasite Council (CAPC) Forecast Maps for 2014, which predict a very active season for transmission of Ehrlichia for all endemic areas particularly the Southeast with an extreme risk of infection for those in Oklahoma and Texas. Dogs are infected with Ehrlichia spp. when fed on by ticks. The Brown dog tick (Rhipicephalus sanguineus) and the American dog tick (Dermacentor variabilis) are thought to be the primary vectors of Ehrlichia canis. Two other Ehrlichia species (Ehrlichia ewingii and Ehrlichia chaffeensis) seen in companion animals are thought to be maintained in a transmission cycle between white tail deer and the Lone Star tick (Amblyoma americanum). However, D variabilis can also transmit E chaffeensis to dogs. To find out more about ehrlichiosis click here. CAPC bases its parasite forecasts on several key factors, including temperature, precipitation, humidity, elevation, forest cover, population density, reported ehrlichiosis cases and deer strikes with cars. The forecast also is also the collective expert opinion of respected parasitologists who engage in ongoing research and data interpretation to better understand and monitor vector-borne disease transmission and the changing life cycles of parasites. Click here to learn more. Preventing exposure to the ticks that carry Ehrlichia is the best means of preventing ehrlichiosis. Check your dog daily for ticks and remove them as soon as possible (it is believed that ticks must feed for at least 24-48 hours to spread Ehrlichia). This is especially important in peak tick season or if your dog spends time in the woods or tall grass (consider avoiding these areas in tick season). Products that prevent ticks such as monthly parasite preventatives (e.g., Frontline®, Revolution®) or tick collars (e.g., Preventic®) can be used; be sure to follow your veterinarian’s advice when using these products. Keep grass and brush trimmed in your yard, and in areas where ticks are a serious problem, you may also consider treating the yard and kennel area for ticks. Stop by Lochte Feed for you Flea and Tick products. We have a wide selection including: Adams, Bio Spot, & Sargents. Come in and get your pet relief today! This entry was posted on Wednesday, May 11th, 2016 at 5:15 pm	and is filed under News & Updates. You can follow any responses to this entry through the RSS 2.0 feed. Both comments and pings are currently closed.